It is pretty bare bones. My intent was to make it suitable for wiring into other devices rather than, say, producing a complete standalone unit or Eurorack module. It outputs velocity control voltage for each note. Velocity data is included with every MIDI note, so it makes sense to use it for additional expression. It supports pitchbend as +/- a whole step. Pitchbend is required to play microtonal pitches, as I like to do. It uses a 12-bit DAC. This means that the pitch resolution is (5 octaves / 4096 voltage levels) ~1.46 cents, which is a smaller interval than we can discern. 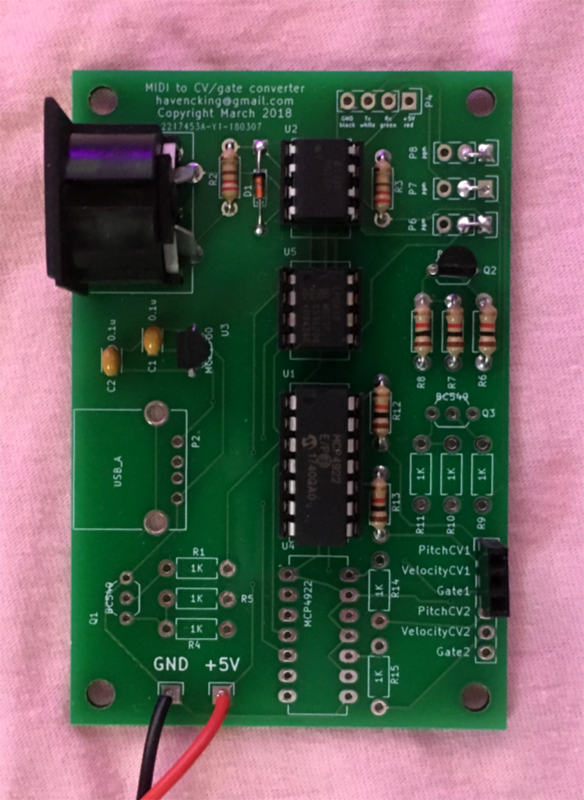 Powered by ground and +5V lines. Be sure to use a clean source because the tuning depends on it. Accepts as input MIDI notes and pitchbend events from all MIDI channels. MIDI notes 24-84 (3 octaves below middle C and 2 above) are the 5 intended octaves. MIDI notes 0-23 and 85-127 just wrap around, i.e., 0-23 are the same as 60-83, and 85-127 are the same as 25-67. Other MIDI messages are ignored. Outputs 5 octaves of pitch control voltage (0-5V, 1 volt per octave), velocity control voltage (0-5V), and gate (0V off, 5V on). Last note priority for up to 10 held notes. More than 10 notes held results in dropping notes.